And oh, forgot - the DJ ANH was sprayed with rattle can - car paint called, at the time, plasti-kote. 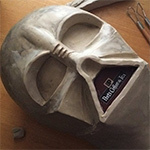 I recall that Don Bies was using the exact stuff on his Vader prop repainting so I did the same. The refined Vader is also same spray cans, rubbed out extensively but not the gun metal color - that is as applied - and then clear coat put over that and rubbed out with 1000 grit sanding preceeding layers of plastic polish and then wax. Know it's an old thread, but just looked through it for some ideas on painting and brands of paint and wondered as I've not been able to find any gunmetal color on the Plasti-kote website. Would be cool if you could remember the color codes. Really like the finish you got on both helmets. I'd have to see the can in person to see if the paint even looked right.